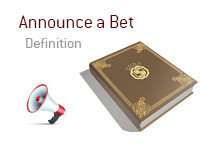 What does it mean to "announce a bet" in poker? What is the definition of the term "announce a bet"? In poker, "announcing a bet" occurs when you verbally declare that you are going to be making a bet. For instance - let's say that you are sitting in a No Limit Hold'em cash game. Action folds around to you on the button. 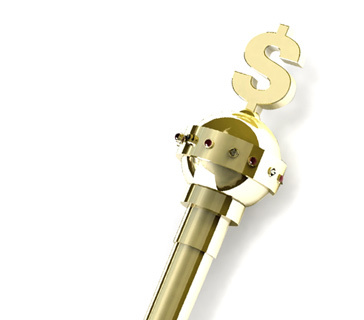 You announce "raise" - this means that you are committed to AT LEAST a mini-raise. Your verbal bet is binding in this case - you can not retract your verbal bet. Now, in this case, you didn't announce the size of your raise, which means that you can still put in any amount that you want, provided that it is at least a mini-raise. Let's take a look at another slightly different example. You are sitting in the same No Limit Hold'em cash game. Action folds around to you on the button. You say "call", which means that you are now committed to calling. You can also announce the size of your bet as well. Let's say that you and another player are in a hand. The turn has just been dealt, and you are first to act. You say "Bet $50" - this means that you are committed to a bet of $50. You can't suddenly put in $200, and you can't suddenly declare that you are going to check instead. Verbal bets are usually binding.